This Marriott promotion in India is valid for bookings until 31 August 2014 and stays until 30 September 2014. 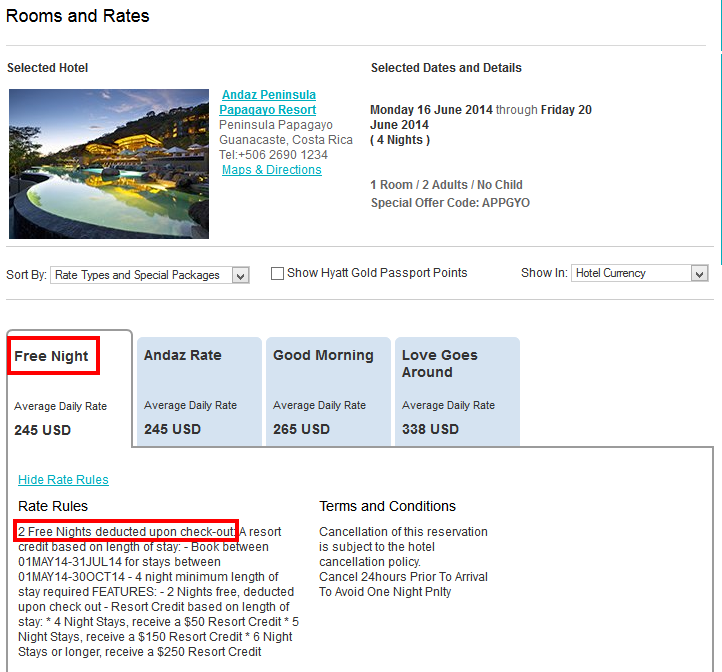 How it works: when you book three nights or more, the last night will be deducted from the invoice at check-out. If you stay only two nights, you will get a voucher to spend a free night at the same hotel until 30 September 2014. Once you have performed the search, this special rate is shown as "3 for 2 Offer". These are flexible rates, so you can cancel for free in case your plans change. Remember, you will not have to pay the last night of your stay, so deduct that from the total for the stay, in order to find out the average price per night (for example: if the daily rate is 5 000 INR per night, at check-out you will only pay a total of 10 000 INR for three nights, thus resulting in an average of 3 333 per night). This UNA Hotels promotional code is valid for bookings until 20 July 2014. It returns a discount of 20% off the best available rates. Type the code in the field "Promotional code" in the search form, just below the Checkout date. In the search results, look for the rate called "Feel the Italian Passion" - it should be exactly 20% cheaper than the flexible rate. So far we have stayed at UNA Hotels in Benevento and Naples (both in the Region of Campania). We were satisfied with the room facilities, however the breakfast was limited in choice and quality at both properties. This deal is offered by TravelPony, where the double room starts at 71$ per night, taxes included. Rates are flexible, with free cancellation up to 72 hours before check-in date. The best rates are available during week-ends. 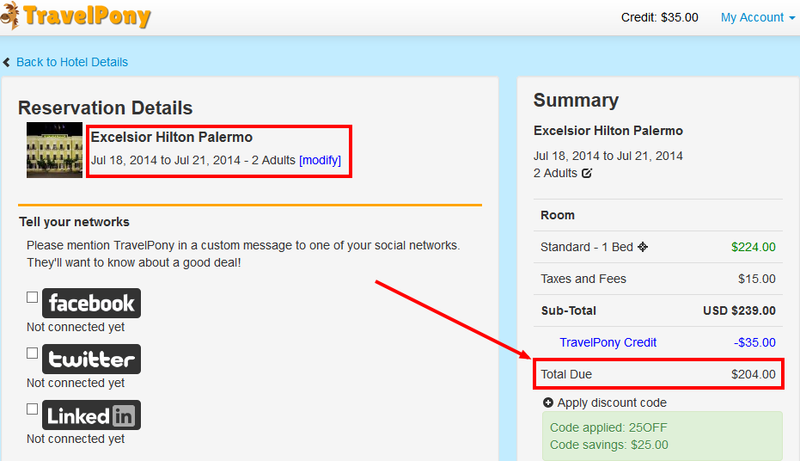 For example for the night of 19 July TravelPony sells the room for 71$, while Hilton and the large online travel agencies sell the same room for 165$. Also mid-week the deal offers a 60% discount: for one night on 19 August the price on TravelPony is 107$, while Hilton and the large online travel agencies sell the same room for 280$. If you stay multiple nights, you could get an even better deal, as you benefit from this 35$ discount when you purchase minimum 200$. Let us know how this offer worked for you. This low price is for a double room including breakfast, for stays of 3 nights. It should be booked with TravelPony, where the lowest price is obtained for 3 nights stays, due to their 60$ discount when you purchase minimum 250$. See full details on how to obtain the discount here. 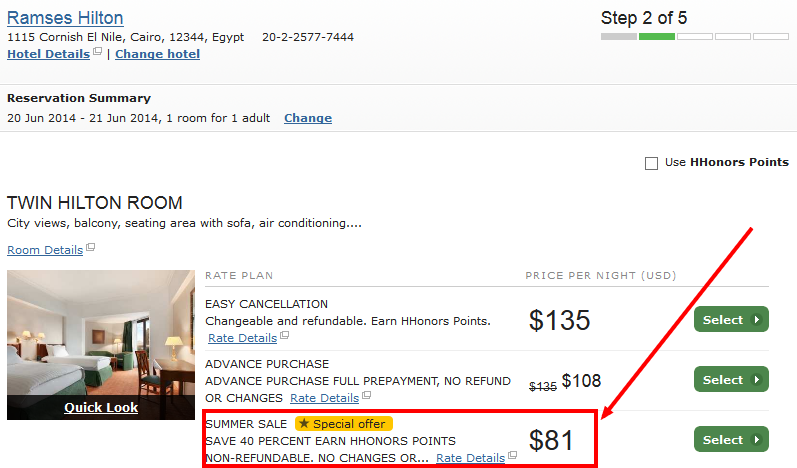 On Hilton's website or on Booking.com, the same room sells for twice as much. Most probably an error rate. Valid for one night only (24 July 2014). Let us know if you managed to take advantage of this offer. A friend of ours recently asked us what are the cheapest accommodation offers for Disneyland Paris. He meant both what are the cheapest hotels at Disneyland Paris, but also what are the best quality / price ration hotels in and around the adventure park. After a bit of research, we are listing below the choices for accommodation at Disneyland Paris. We looked for hotels that are affordable, close to the parks, are clean and well maintained and thus, provide the basis for a great time at Disneyland Paris. To put things into context, we looked for the best deals at Disneyland Paris for a family of four, during the upcoming summer school holidays. Disneyland Paris does not mean only the park itself, but also the range of accommodation offering called "Disney Hotels". There are 7 such hotels, covering all tastes from the camping style wooden cabins at the Disney's David Crockett Ranch to the 5-star called Disneyland Hotel. The best place to book these hotels is the Disneyland official website. The advantage of booking Disney's own hotel is that you can find year-round packages offering accommodation on a half-board basis, but also free tickets for both parks (and free FastPass and Extra Magic Hours with some packages). Disney's Hotel Santa Fe - £1,404 including park tickets and half-board. For approximately £50 per night, you can upgrade to a full-board basis (thus including all three meals of the day). This hotel offers all the necessary room amenities for an enjoyable stay. The downside is that it does not have a swimming pool and the property is split between several buildings, some of them at quite a distance from the main building. At the same price you can also book the Disney's Hotel Cheyenne, a Wild West themed hotel. A better property is Disney's Sequoia Lodge, offering both an indoor and an outdoor pool. Go for the Golden Forest rooms for an improved experience. For the period we checked, prices were in the same range with the lower classified properties, so this one is definitely worth it. The other Disney properties get more expensive as the star ranking increase, so it seems that Disney's Sequoia Lodge would be our choice for staying at one of the park's hotels. However, looking at all the options, it seems that the Explorers Hotel at Disneyland Paris*** is the best option from the pack. Total price was £407, breakfast included. Free internet, parking and shuttle to the parks. Tourists praise the indoor pool and the playing grounds for children. Leave a comment at the end of this post to share which hotel you chose and why. The offer is valid for members of the Hyatt loyalty programme, called Hyatt Gold Passport. If you are not yet a member, join here for free. The 2 free nights are offered for stays of minimum 4 nights, thus giving a 50% discount over the entire stay. Rates are flexible, so you can cancel 1 day before arrival. In addition to the free nights, you also get resort credit, for up to 250$ for stays of 6 nights. These flights are operated by SAS - Scandinavian Airlines. The discounted prices are available when booking through the online travel agency called AirFastTickets. 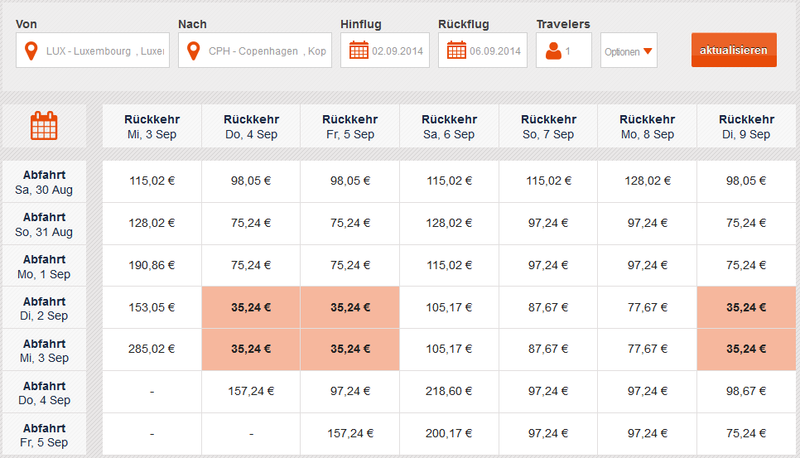 This agency also has an English website, but the best prices are shown on the German version. If you do not understand German, you can do the booking in parallel on both the German and UK website, but complete the reservation and make the payment only on the German site. Let us know if you still found availability of this offer. The discounted rates are valid mainly for week-end stays, though some properties might also offer these rates during the week. The offer is valid for booking until 31 July 2014 and stays between 18 July and 28 September 2014. - after you made the reservation, you must fill in and print this voucher form (it might be required at the hotel at check-in). In the field "Company (partner) where you received this discount from" please write "Commission Junction". The other fields are to be completed with the details from your reservation. Let us know how this deal worked for you. This 20% discount code is valid at all Wyndham hotel brands, such as Wyndham, Ramada, Days Inn, Howard Johnson, Microtel, Hawthorn Suites, Super8, Travelodge, Knights Inn, Baymont Inn and Suites, Wingate, TRYP by Wyndham, Dazzler Hotels, Dolce Hotels & Resorts. Once you've performed the search and selected the hotel desired, you will this discounted rate named "Allied Business Network", which is usually 15% lower than the standard flexible rate. This special rate is also fully flexible, so even if sometimes it might have the same price as the advance payment rates, you will be better off booking under this rate because it gives you flexibility to change or cancel the reservation without any penalty. This Wyndham Hotels discount code was provided to us by Allied Business Network (ABN Save), a free membership programme which offers various discounts from merchants worldwide. Once you've made your reservation, you can also get a 6-digit member number for free here, so that you have it, in the very unlikely case that at the check-in the reception clerk asks about this rate. These flights are operated by Brussels Airlines, the Belgium national carrier. However, in order to get the best prices, use the online travel agency called AirFastTickets (a new and price aggressive booking website). Let us know if you grabbed this deal. We've aggregated the hotels offering Park, Sleep and Fly hotel packages at the Dublin International Airport (DUB), in the ascending orders of price (starting with the cheapest package), as we found them for a night's stay on the 27th of June 2014. This new Expedia discount code is valid for stays until 20 August 2014. As usual, the Expedia discount code is not valid for large hotel chains (Hilton, Marriott, etc.). Deal addressed to member of the Best Western Rewards loyalty programme. If you do not have an account yet, get one for free by clicking here and then the button "Join today"
Once you have an account, you have to register online for the promotion. Once you've completed 3 separate stays after registration, you will receive a certificate for a free night. - 31 January 2015 for using the certificate for a free night. - the free night certificate may be used only at properties in the USA, Canada and the Caribbean islands. This could be a deal if you have several one-night stays planned in smaller towns where there aren't other hotel chains with better benefits. Be aware that consecutive nights at the same hotel count as only one stay. We have stayed so far at the following Best Western hotels in Europe and we were overall satisfied: in Bastia (Corsica), Perugia (Italy), Neumunster (Germany), Agrigento (Sicily), Viterbo (Italy), Varese (Italy), Brescia (Italy) , Ferrara (Italy), Zalau (Romania), San Bonifacio (Italy). A new Hotels.com coupon code, valid for bookings until 1 June 2014. Valid for 300$ minimum purchase, thus returning a whopping 15% discount. In the final payment window look for the section "Apply a discount code", below the total price, on the right side of the screen. There type in the Hotels.com promo code and push the button "Apply". As usual, the promo code is not valid for large international hotel chains. Summer sale from Hilton Hotels and Resorts for week-end bookings made until 30 September 2014. These discounted rates are also valid for the bed and breakfast packages. Rates are non-refundable, so book only if you are sure of your travel dates. Not all properties offer a 40% discount. The terms and conditions of the sale indicate that most properties will give a 33% discount, which is still a good offer. Best Western are offering a special promotional rate valid for the entire year 2014 when applying a special Best Western promo code. Depending on the property, the rate returns a discount of between 10% and 25% off the best available rate. 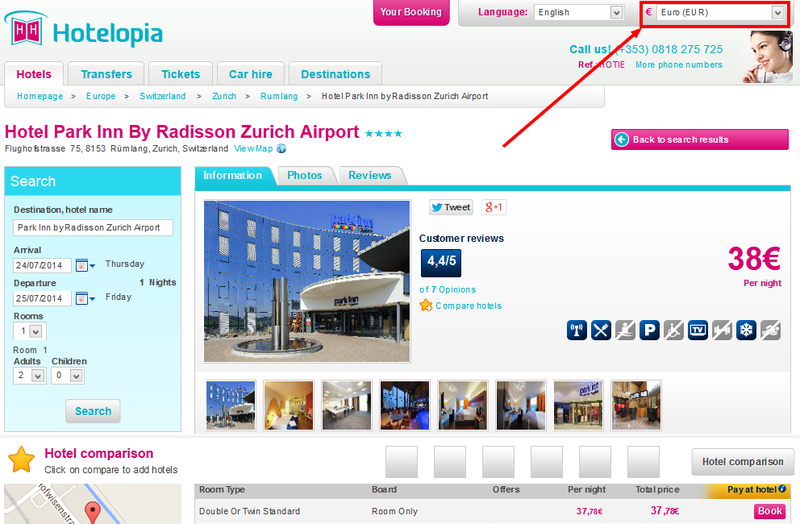 In the search results, this offer rate is called "Managers Special" and has flexible cancellation conditions. There are some properties that do not participate in this promotion and this rate is not offered. This discounted offer is valid at the Holiday Inn Southend****, for up to 2 adults and 2 children, for stays until 30 December 2014. For bookings of minimum 3 nights, Hilton offers a special rate that gives a 30% discount compared to the standard best available rates. The rate is subject to availability, so it might not always be available at all properties. Let us know how that worked for you. Most of the major international hotel groups include in their portfolio a hotel chain that includes free breakfast in the room price. Moreover, these chains also offer free in-room internet. British Airways offers return flights from Luxembourg to New York (via London) at only €412 per person (all taxes and fees included). We checked several dates in July and August 2014 and the offer was valid. The Priceline promo code is valid for stays anytime, for purchases of minimum 100$ (thus giving up to 20% discount). The coupon code must be typed in the field "Apply coupon" next to the "Summary of charges" section (above the traveller information). Offer valid for members of the Accor loyalty programme, at participating hotels (Mercure, Novotel, Ibis) in United Arab Emirates, Jordan, Qatar, Egypt, Bahrain, Kuwait, Oman and Saudi Arabia. If you are not yet a member, you can join the Accor loyalty programme for free here. This discounted rate also offers free breakfast, triple loyalty points and 10$ per day to spend in the hotel. The deal is valid for bookings until 19 August 2014, for stays between 1 June and 15 September 2014. Special offer valid at selected Ibis properties, for bookings until 31 May 2014 and stays between 1 June and 31 August 2014. Rates are non-refundable, so book only if you are certain of your trip. Expedia UK offers a £100 discount code for flight + hotels packages consumed until the end of 2014. The Expedia discount code is valid for purchases of minimum £1 000 (thus giving up to 10% discount). A minimum of 5 consecutive hotel nights is required. 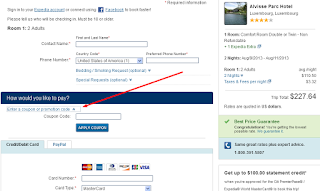 The Expedia discount code must be typed in in the section "Enter a voucher code" in the last window of the reservation process, just above the credit card details.